Last night Prime Minister, er Former Prime Minister, Romano Prodi lost a confidence vote in Italy’s Senate after he had easily won in the Chamber of Deputies, the lower house. You can read details about what happened here and read my friend Paola’s take (with which I happen to agree) on the whole thing here (in English). So what does this mean? Well we could be looking at either an interim caretaker government (which just might be led by . . . Prodi) *or* a so-called snap election. Because goodness knows what Italy needs is more elections. It’ll be up to President Giorgio Napolitano to decide. As Eric Reguly notes in this article, this turn of events opens the door for the return of Silvio Berlusconi, Former Prime Minister, billionaire, controller of a large chunk of Italian media, and, in some political circles, the Anti-Christ, as the leader of the Bel Paese. On a personal note, this could also mean that I’d get to vote for two countries’ leaders in one year. Still, I’d prefer the interim government to give President Napolitano a bit of time to fix the electoral system so that fewer parties would be able to spit (literally as it turns out) and fight for control in Parliament. The last election put 40 different parties in there, which turned into a lot of power struggles, strange bed fellows, repeated confidence votes, and general chaos. Ah, and a fallen government. Kinda feels like déjà vu all over again, doesn’t it? The last time Italy’s government fell eleven months ago, I posted this and suggested we all turn to alcoholic children’s snacks to ease our pain. But I say we up the ante. I hear that Hershey’s is making some mints whose packages resemble street packets of cocaine–although not for too much longer, so hurry and grab yours today! Talk about an Ice Breaker! Click here for a photo on the off-chance that you, too, had no idea what a mint that resembles a street packet of cocaine might look like. Tacky tacky tacky ain’t it? Although I’ve never heard of any actions such as those you mentioned that happened there with the politicians happening here in Washington, there are times when I betcha some of those people weren’t far from doing the “spitting” -probably some drinking celebrations of some sort off camera range too from time to time. I suppose it’s just a matter of time before some of the bitterness that builds in a campaign though might come through like that there too. Apparently they had mortadella stuzzichini with the champagne :). I would have commented on the great look to your new site earlier, but being technologically illiterate, I could find where to leave it! Sorry you couldn’t find where to comment, though; I probably should’ve mentioned something in the welcome post. Anyway, glad you figured it out! I’ve been fascinated reading this and the posts over at Jennifer’s blog. I think we could do for some of this drama in the U.S. I’d love to see Bush’s government fall, and Nancy Pelosi spraying champagne all over the Senate chambers. Now, that would shake things up, wouldn’t it? Well I wouldn’t mind that part about the Bush government falling . . . . Yes, wasn’t that something last night all the mayhem and rowdiness in the Italian senate? I really appreciate your post, since I am a newbie to Italian politics and find the myriad parties baffling. Napolitano impresses me, though, as an individual. I don’t know enough to say how I feel about his politics, but his health is stellar. Here he is in his 80’s, and yet when you hear him speak, he is more lucid than a lot of folks in their 40’s. mentalmosaic’s last blog post..Naples, Italy: It’s da bomb, literally! I find it all baffling as well although I’m learning slowly. Very slowly. Personally I am from the Berlusconi= antichrist camp. He is a criminal and a thief and has always openly used his political position for his own personal agenda. It amazes me that he is still so popular.But that is what happens when you let a single individual control such a huge amount of the media. And the Left never was able to legislate that out of existance. I am also in shock over those “street packets” of mints! That is so deeply wrong and cynical. I wonder if they were a hit? I’m completely with you on Berlu Juli. I just don’t get how people keep voting for him. He’s just so pompous on top of the actual corruption. Mah. And the mints? Just too weird not to mention when I read it. Just too weird. We talked about this last night in our Italian class. Of course the discussion was in Italian so I only understood the context. I won’t be able to vote in Italian elections (only the U.S. and France) but I do find it all very, very interesting. I hope some election reforms are passed soon. They can’t keep having governments fall apart every year. It’s not good for the country. You can’t get anything accomplished if you are constantly worrying about keeping an unlikely coalition together. I completely agree, and it actually seems like some people in power are starting to agree too. Maybe. Definitely hoping for election reforms here too. Like you said, you can’t get anything done looking over your shoulder–Prodi was up for something like 30 confidence votes in 20 months! That’s just pazzo. haha! gotta love it. it’s been an entertaining day learning about the craziness that is the Italian gov’t today. We began a discussing in class then I’ve read several articles since. Who knew that reading blogs could be so educational? Italian civics lessons PLUS candy dressed as street drugs. Now I have an answer to the question “what did you learn today?”. This is another case where I’m sort of disgusted as a wannabe Italian at the antics of the governing class (although the Barbato/Cusumano tiff was classic opera buffa) and yet defensive when I read sniffingly disdainful articles in the few U.S. papers that bothered to pay attention. Electoral reform is almost certainly the way to go, though I will miss a system that allows people like Vladimir Luxuria to have a seat. Did you see the front page of the psiconano’s paper today? I hear you. Kind of like “It’s our mess and we love it” but not. I said the same thing to P last night about Beppe Grillo as soon as the vote was announced. Ri-freaking-diculous, though, is hard to translate. Ilgiornale.it won’t open for me. Bastardi. I’ll try again domani. I will never again get my Italian news from the internet or RAI, I will always come to Bleeding Espresso because she makes the news understandable and hilariously funny. I actually think I understand the Italian government now thanks to her! And don’t you find the similarities between Bush and Berlusconi hauntingly similar? And yes, far too similar for my tastes as well. And this is one of those things that never changes………. Dude that’s Twilight Zone creepy. Cornuti! Anyway, no respecting southern Italian would ever do that in public. I can’t wait to show P that photo. How many failed regimes does this make since the end of WW II? It seems to me that it must be over 60 from what I remember relatives talking about many years ago. I heard that the shrub was moving to Sicily and will ‘win’ the next Italian election with a little help from his friends in Florida. Looked for the mints last night and it appears that the clerks in the local “Inconvenience” snapped them all up! Over 60 is what I’ve heard too. And I would *love* to see Bush in Sicily. Just for a week or so…. Sorry you couldn’t find the coke, er, mints. Not very “convenient” now is it? It seems like the older I get, the more I realize how this “low -life”, corrupt politics not only goes on now, but it always has. In Italy, France, USA and all over the world. It is SO disappointing but true. Once a few years ago I asked my husband if he thought is was getting worse, and he thinks, it’s ALWAYS been this bad!!!!!!!!! Ok. Too late for expresso, so off to buy some Hershey’s mints. Maybe that will make me feel better! It is depressing if you think too much about it–how can things possibly change when greedy politicians have been around forever? Still, other governments at least manage to function a little bit. Here in Italy, there’s just nothing. Even if they got up to an iota of functioning, it’d be progress. 1) why does one count back to WWII when talking about Italy’s governments? The Republic was brand new in 47 and is based on European parliaments so there always sounds like a raised eyebrow lack of understanding when I hear that. The obverse is being stuck with Bush just because he has time left on his meter. Aw, what’s a few years among republics? 2) Why do newspapers and newscasters talk about the “collapse” of the government? It doesn’t collapse. The control of the Parliament passes, sometimes not very far. I know it’s because not very many US reporters actually get the vote of confidence thing, but keep wondering why not? My best guess? The translate “cade” quite literally and leave it at that. I’ve heard it a bit more appropriately referred to as “the collapse of Prodi’s government,” which makes it more specifically about the leader’s coalition falling, which is true. But then if you reason that the leader’s coalition/government kind of *is* the country’s government, I don’t think it’s that far off to say it’s collapsed or fallen. 3) If you think anyone might vote for Berla, give them sleeping pills until the danger is past. He made sure nothing would get accomplished by this present government with its tiny margin. Then after a while he started bragging that this government accomplishes nothing. Reforms were never even possible with Berla in the piazza. He is, after all, the one who when he acceded to P of Consiglio, passed a law making his alleged “crimes” impossible to proceed upon until the statute of limitations ran out. He has been working on getting this election since he lost the last one, no matter that the country can’t afford it. He cares nothing for the country. I wonder who among them does care? Couldn’t agree more. He’s been telling Prodi and his government to go “a casa” for just about 2 years now. I can’t imagine that people think that’s what’s best for the country, but I wasn’t born here. P and I were talking about this the other night, and P made a good point–we have the rich and sleazy in America but at least sometimes, every now and again, they actually do something for the little guy and help the country as a whole. Here, well…. I’m curious to know, does this constant change have an impact on peoples’ daily lives over there? Diane, as far as I know, there’s still no decision on whether we’ll have an election or a caretaker government. Stay tuned! Does this affect people’s daily lives? Yes and no. For the “no” side: Did, for example, Thursday with Prodi in charge feel different from Friday when he wasn’t anymore? No, not at all. We all go about our business and complain and shake our heads and hope that someone, anyone in or running for Parliament will develop a conscience and concept of the common good. Or at least I do. Two things are permanently linked in my mind by now : the italian parlament/senate and the movie “Aliens”. You know that movie. That’s the one where Sigorney Weaver utters the immortal line “Let’s nuke the place from orbit. It’s the only way to make sure.” I sort of feel like that when i read the news. That’s awesome Luigi. Such a great comparison! Wow, that’s pretty wild with the champagne and all! Things are getting wild here in the US too. Today is the South Carolina primary and I cannot even imagine how this day is going to end. By the way, since you have dual citizenship, do you vote in elections here too? And on a totally unrelated matter, I just bought my first jar of Nutella and I think I may have a recipe. I’m getting excited about World Nutella Day! Anali’s last blog post..What Do Gisele And I Have In Common? Yes Anali I vote in US federal elections. This year I can even vote online through DemocratsAbroad.org. Woohoo! I’m so happy to hear about the Nutella! I was just looking through some Nutella info myself…. Thanks for showing the cocaine packets, as I would not have noticed what the packaging implied AT ALL! What was Hershey thinking? Isn’t that a no-brainer? I don’t know how long they were on the market, but I’m betting *someone* is in trouble…. Champagne, spitting, fainting and candy cocaine? Uh oh, I’m starting to feel a little nauseous. You’re not the only one, Debbie. Believe me. l wanted to comment on your new look blog, it is great you have done a really good job on it. Thanks Cleopantha! 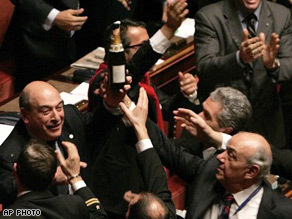 I’ve heard of champagne to celebrate, but not on the Senate floor…. now about Hershey’s…those deceitful little boogers…when they upended the town to outsource their production (how can Hershey *not* smell like chocolate??? )…i am quite sure that milton rolled over in his grave! even though i am not a boycotter by nature, i placed an embargo on their products at casa piacere ’cause they are messing with my people up there! & now cocaine-wannabe candy???? they have totally lost it!!! can you tell what upsets me more??? government vs. chocolate… you know what pulls my heartstrings, hon! I have to admit that the Hershey’s thing hit me a bit hard as well; Milton S…where are you when the world needs you?! If there were more women in the Italian parliament (ahem) we might could have a regular old soap opera….